Elizabeth Huey's paintings explore human connection and healing. Born from a substratum of expressive paint, the architectural and figural elements in her work hail from a multiplicity of styles and eras. Huey draws imagery from her own photographs as well as an ever expanding collection of found snapshots. Historical research is employed to delve into the complexities of her subjects. Driven to depict the inner motivations of the heroic, Huey’s paintings are portraits of the miraculous. The spatial arrangements and scale shifts support a hypnagogic sense of seeing things from the inside out. One gets the sense that myriad forces are at work in the minds of each protagonist. Ultimately, Huey’s paintings are about remembrance and reconstruction: a totemic reminder of our human capacity to overcome trauma and draw invention from catastrophe. Before earning an MFA from Yale University (2002), Elizabeth Huey obtained a BA in Psychology from George Washington University (1993) and studied painting at both the Marchutz School in Aix-en-Provence, France and the New York Studio School of Drawing, Painting and Sculpture in Manhattan. 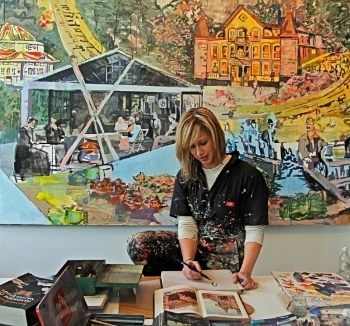 She was awarded the Terra Foundation Fellowship and Residency (2001) in Giverny, France, the Johns Hopkins University Artist Travel Fellowship (2006) to Bologna, Italy, and the Artist Research Fellowship from the Smithsonian Institution (2008) in Washington D.C. Most recently, she was awarded the Alma B.C. Schapiro Artist Residency at Yaddo (2014) in Saratoga Springs, NY, and the Soho House Artist Residency (2016) in Miami, Florida. She has exhibited both nationally and internationally. Born in Virginia, she now lives in Los Angeles. Her work has been featured in Anthem, Artforum, Boston Globe, The New York Times, Slate, Vice, Village Voice, Washington Post, among others.